Last Saturday, Sept. 29, men’s soccer faced off against Hamilton at home on Jackson Field. The weather was excellent for a Family Weekend matchup, and a crowd of over 350 people gathered for the proceedings. The home crows was disappointed, though, when the Cardinals were beaten by an overtime golden goal for a 1-0 loss. From kickoff, it was clear the game would be a battle. Wesleyan created a few half-chances in Hamilton’s half, but Hamilton goalkeeper Thomas Benson held strong in net. In the thirtieth minute, the Continentals created back-to-back chances in front of the Cardinal net, but failed to capitalize on the opportunities. The teams went into the half evenly matched in corners (2-2) and with similar shot statistics (9-7) leaning in favor of Hamilton. The second half tilted in Hamilton’s favor, but the Continental forwards struggled to score on Cards’ goalkeeper Chris Franklin ’21. Seventy-five minutes in, a blocked shot from Jack Pironti ’22 bounced out to fellow first year Tucker Kelsch ’22, who aimed a volley into the top left corner of the net. A leaping Benson saved the day with a parry over the crossbar. At the end of 90 minutes, the score remained 0-0 and the game went to overtime. The Continentals came out firing, and within a few minutes created chances in the Cardinal’s third of the field. 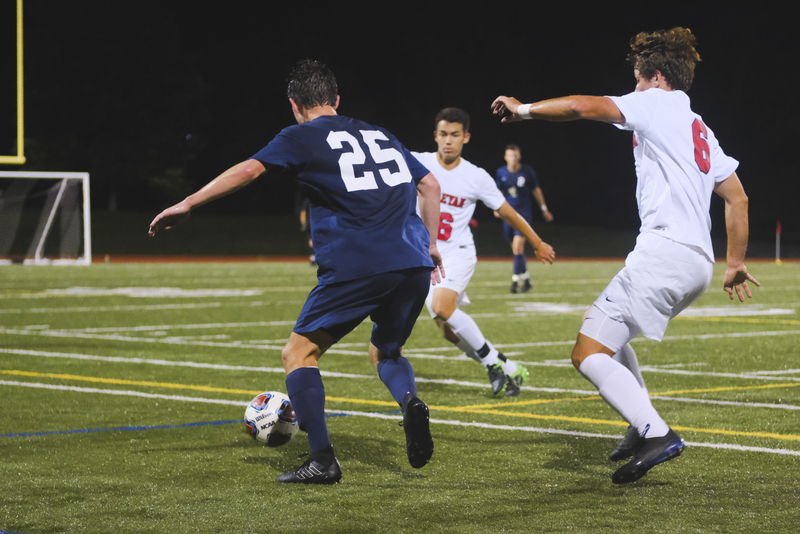 Their efforts were rewarded in the ninety-sixth minute, when a leaping Noah Giovanelli headed a pass down into the path of first-year forward Sam Dils, who smashed it into the top of the net for a golden-goal victory. The loss pushed the Cardinals to 2-4 overall and 1-2 in conference. Fortunately for the Dirty Birds, fellow Connecticut NESCAC school Trinity made the trip up to Citrin Field in search of its first conference win of the season. 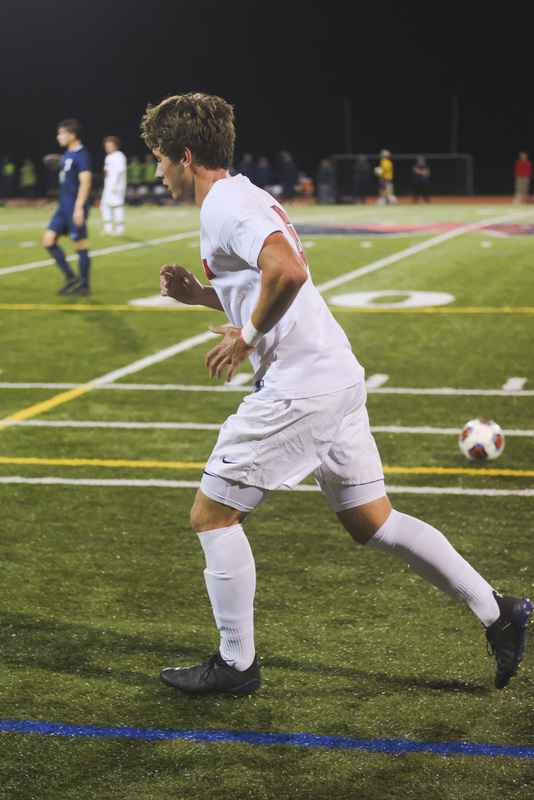 The Cardinals needed a win, as only the top eight teams qualify for the NESCAC tournament. A matchup against Trinity, with only one goal in conference, presented an opportunity to right the ship. The Bantams wasted no time getting on the score sheet, as Trinity’s John Mullin shook off his defender to place a shot past a diving Franklin. After the initial shock of the goal, the Cardinals wasted no time in their response. Constant throw-in danger Sam Serxner ’21 lined up a toss in the thirty-seventh minute from the sideline. After a few quick paces, he hurled the ball into the box over the head of goalkeeper Everett Lyons. The ball landed at the feet of Trevor Devanny ’20, who scored, leveling the game at 1-1. 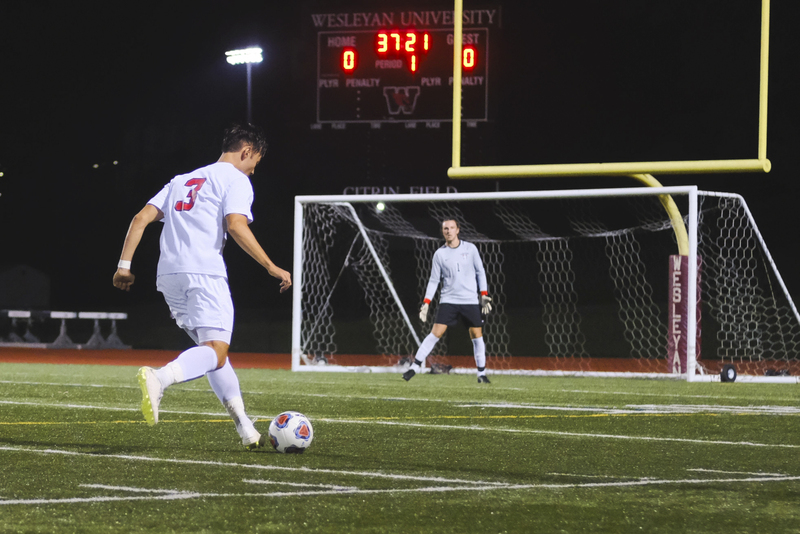 The goal gave the Cardinals the momentum they needed, and the game tilted in the Wesleyan’s favor soon after. After the first half ended at 1-1, the second half was all Cards. The Red Birds attempted nine shots while holding Trinity to just one, and added 11 corner kicks in the process. Despite the pressure going forward, the Trinity defense kept a clean sheet with a little help from some poor finishing from Wes. The best chance in regulation came in the seventieth minute when JJ Lacorte ’22 fired a shot just over the crossbar. Despite scoring their first goal in three games, the Cardinals were headed to their second straight overtime game and fourth on the season. It didn’t take long for this one to end in drama. Just over two minutes in, Kelsch enjoyed an ambitious effort from over 30 yards from goal. Kelsch’s effort miraculously found the back of the net, and the Cardinals flocked to celebration. With the win, the Red and Black moved to 2-3 in conference and 3-5 overall. Trinity fell to 0-6 in conference and 2-7 overall. The victory was the Cardinals first regular season win over Trinity since 2013, which snapped a four-game skid. Wesleyan is moving closer to its first NESCAC playoff appearance since 2015, when the team reached the finals of the tournament. Although sidelined by injury, Matt Blackman ’21 offered valuable insight into the flow of games this year and where the team can improve. Next up for the men’s team is a battle against ninth place Colby, who sit only a point behind Wesleyan in the standings. The game will be at 1:30 p.m. tomorrow, Oct. 6, at Colby.